Some of you may be familiar with the tale of Danial Boon's Bigfoot encounter. In a 1992 Boone biography, John Mack Faragher writes about him "killing a ten-foot, hairy giant he called a Yahoo,” What better place to do some Bigfoot field research than the Daniel Boone National Forest. 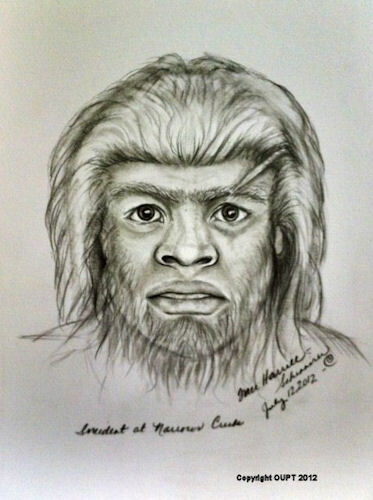 A local Kentucky paper, the Morehead news ran a story today about a a 60-person investigation that brought one person eye-to-eye with a Sasquatch. The picture above was in the inset of the article, and had more to do a with a sighting in Pennsylvania, but they paired it with the article becuase it was part of a slideshow. We tracked down the picture origin and you can read about it here. Sept. 10, 2012 — Nearly 60 persons paid $75 apiece Saturday to join paranormal researchers in the search for Bigfoot in the Daniel Boone National Forest. One of those said she was lucky enough that night to catch a glimpse of the creature. Teresa uses only her first name, as do many Bigfoot believers, for fear of ridicule. She is an established spiritual medium and animal communicator from New Jersey. She and her group had been walking the trails near Cave Run Lake for a few hours Saturday night and were not very deep into the woods, she said, when she heard grunting and growling. Her group stumbled upon the creature as he was trying to kill a deer. He was interrupted by bright lights shining in his face. “When the flashlight hit his eyes he immediately turned his head and moved his body and turned the opposite direction we were in,” she said. The eight-foot-tall creature quickly ran away, deep into the forest, Teresa said, with her chasing him. “I wanted to talk to him,” she said. The sighting happened between 11:30 p.m. and 12:30 a.m., she said. There were three search groups and, according to Teresa, hers was the only one that spotted the big, hairy, ape-like man. “I think the permit pretty much speaks for itself,” Teresa said. “Why would you issue a permit if something doesn’t exist? “They’re saying, in my opinion, ‘We’re not agreeing or disagreeing,’ but they’re also not stopping us either. I believe the government does know and was that’s why the permit was issued,” she said. Copies of the permit were passed around Saturday afternoon at the Hampton Inn, where presentations were given all afternoon, leading up to the search. The room was filled with persons who were obviously interested in the subject but reluctant to share their stories, especially with the press. “I don’t talk a lot because I don’t want to be put on the sixth floor,” one man said, referring to St. Claire Regional Medical Center’s Mental Health Unit. The hunt lasted from 8 p.m. to 2:30 a.m. Teresa said when crews returned to the Hampton Inn, residents were more comfortable about talking. Researchers and investigators will lead another local hunt in April 2013. Nicole Sturgill can be reached at nsturgill@themoreheadnews.com or by telephone at 784-4116.